Fall has arrived. So let’s gather apples. acorns, pumpkins, leaves and STEM ideas. Autumn provides a wealth of opportunities to integrate engineering activities into the curriculum. Although Halloween can offer some fantastic connections for STEM lessons, many of us have to avoid direct reference to that holiday in our school communities. Respecting our school district’s holiday decisions, however, does not mean we have to avoid seasonal STEM lessons in October. By focusing on nature, food, and animals we can still provide engineering curriculum that incorporates and integrates all the things we enjoy about this time of year. So gather those apples, pumpkins, acorns, and cornstalks that we see everywhere, add in a few squirrels and barn spiders and you’ve created a STEM atmosphere that celebrates the new season! Notice how busy squirrels are right now? They are gathering food for the upcoming winter. They will gather acorns and…. raid the local bird feeder to enlarge their stash. It’s their prime time for gathering food and frequently they raid bird feeders for their stash. Our students have a favorite book titled Those Darn Squirrels! by Adam Rubin, follows the hilarious engineering antics of some very clever squirrels determined to break into the bird feeder. We were inspired by this picture book to create a STEM activity that combined creative bird feeders that repel squirrels and squirrel engineers finding ways into the feeders. It encourages students to analyze a challenge from two angles: the birds and then the squirrels. There are lots of opportunities for discussion and group interaction during this lesson! Fall also means that we have to be a bit cautious as we head outside in the morning to avoid walking into a spider web. If we are really lucky we get to observe a web being created and can marvel at what great engineers spiders are! Challenge your students to see if they can design a spider web as good and as strong as these tiny engineers by having them create their own spider web and then testing its strength. by Emily Morgan as a reference for our students. Don’t stop there! 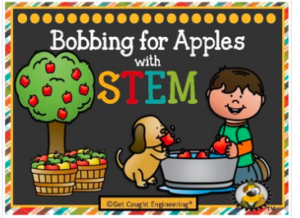 Continue the October STEM theme with a Punkin’ Chuckin’ lesson to explore simple machines, a Corn Maze connection lesson to structural engineering and critical thinking, or a STEM lesson about raking leaves and acorns. We hope your kiddos “Get Caught Engineering” in October!